MS affects women more than men. The disorder is most commonly diagnosed between ages 20 to 40, but it can be seen at any age. 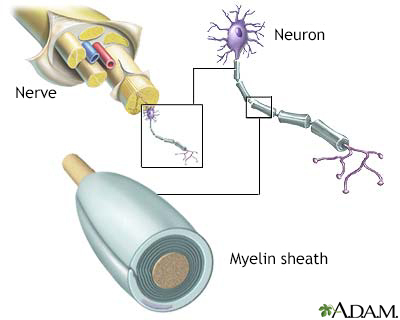 MS is caused by damage to the myelin sheath. This sheath is the protective covering that surrounds nerve cells. 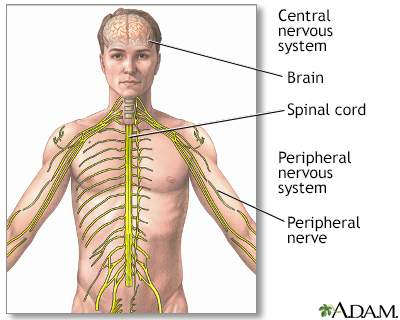 When this nerve covering is damaged, nerve signals slow or stop. It is unknown what exactly causes MS. The most common thought is that a virus or gene defect, or both, is to blame. Environmental factors may also play a role. You are slightly more likely to develop this condition if you have a family history of MS or you live in a part of the world where MS is more common. Symptoms vary because the location and severity of each attack can be different. Attacks can last for days, weeks, or months. Attacks are followed by remissions. These are periods of reduced or no symptoms. Fever, hot baths, sun exposure, and stress can trigger or worsen attacks. It is common for the disease to return (relapse). The disease may also continue to get worse without remissions. 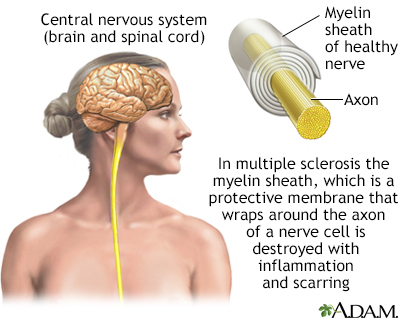 Symptoms of MS may mimic those of many other nervous system problems. MS is diagnosed by determining if there are signs of more than one attack on the brain or spinal cord and by ruling out other conditions. People who have a form of MS called relapsing-remitting have a history of at least two attacks separated by a remission. In other people, the disease may slowly get worse in between clear attacks. This form is called secondary progressive MS. A form with gradual progression, but no clear attacks is called primary progressive MS. Blood tests to rule out other conditions that are similar to MS.
Lumbar puncture (spinal tap) for cerebrospinal fluid (CSF) tests, including CSF oligoclonal banding may be needed. MRI scan of the brain or the spine, or both are important to help diagnose and follow MS.
Nerve function study (evoked potential test, such as visual evoked response) is less often used. There is no known cure for MS at this time. But, there are treatments that may slow the disease. The goal of treatment is to stop progression, control symptoms, and help you maintain a normal quality of life. Medicines are more effective for the relapsing-remitting form than for other forms of MS. The outcome varies, and is hard to predict. Although the disorder is life-long (chronic) and incurable, life expectancy can be normal or almost normal. Most people with MS are active and function at work with little disability. Most people return to normal or near-normal function between attacks. Over time, there is greater loss of function with less improvement between attacks. 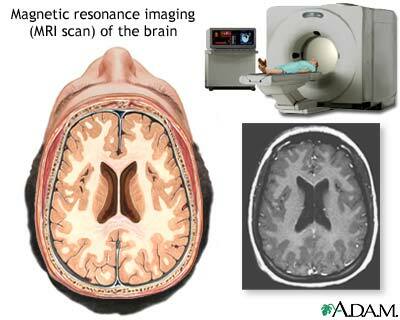 Calabresi PA, Multiple sclerosis and demyelinating conditions of the central nervous system. In: Goldman L, Schafer AI, eds. Goldman-Cecil Medicine. 25th ed. Philadelphia, PA: Elsevier Saunders; 2016:chap 411. Heine M, van de Port I, Rietberg MB, van Wegen EE, Kwakkel G. Exercise therapy for fatigue in multiple sclerosis. Cochrane Database Syst Rev. 2015;(9):CD009956. PMID: 26358158 www.ncbi.nlm.nih.gov/pubmed/26358158. 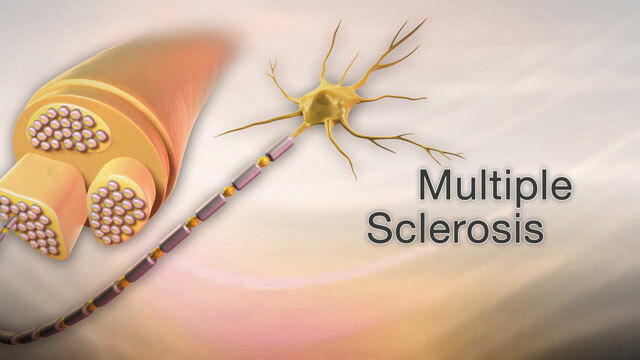 Saguil A, Kane S, Farnell E. Multiple sclerosis: a primary care perspective. Am Fam Physician. 2014 Nov 1;90(9):644-652. PMID: 25368924 www.ncbi.nlm.nih.gov/pubmed/25368924.